What is considered an heavy duty TV stand? 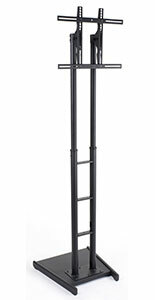 The basic definition is; any durable, strong, or commercial-grade floor standing rack used to display a flat screen television. 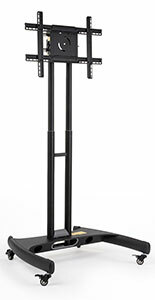 This selection is comprised of our strongest stands to date - plus they come with mounting brackets attached! 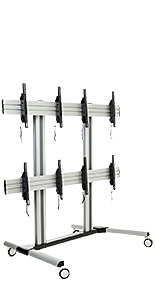 Standardized to fit flat screens ranging from 40" to 110", VESA brackets screw onto the back of the flatscreen television, allowing the user to securely hang the monitors on the racks. Although all of the flat panel furniture includes the necessary hardware to mount most televisions, including 70" monitors, some will require specific screws that can be purchased at a local hardware store. 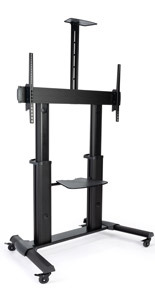 Plus, some of these flat screen heavy duty TV stands have an optional tilt bracket available! 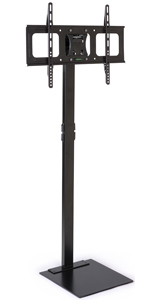 This tilting mount enables the viewer to position the monitor at the best possible angle. 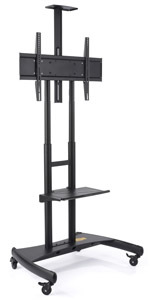 These LCD TV stands are ideal for retail stores, malls and trade shows. Many of these flat screen TV stands are also suitable for corporate boardrooms and meeting areas due to their commercial-grade construction. Use this style of stand in a conference room or in a lobby to display business related information. 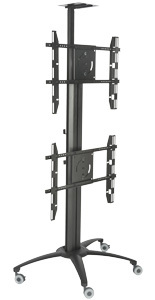 Among this huge selection of plasma TV mounts are displays suitable for residential use. 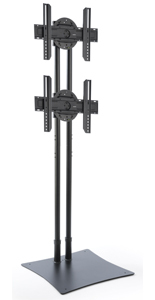 These home LCD TV stands hold flat panel monitors of varying sizes and weights. Choose from entertainment centers featuring glass shelves and tilting brackets. Commercial-grade steel TV stands for home use are versatile racks, and will blend beautifully with any décor. 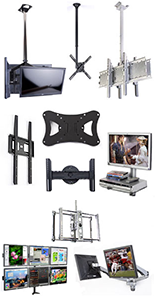 Most of the flat screen mounts offered presently are constructed with premium steel or aluminum. Some durable TV stands feature shelves that are great for displaying supplemental electronic equipment, a preferred photo frame, or even a collectible. Another advantageous features of these entertainment centers is the plastic feet on the bottom of some of these racks. The feet keep the TV stand in place and help to prevent marking up hard wood flooring. 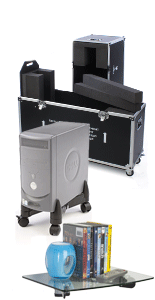 Models are also available with wheels for portability. All of the residential furniture displays require some assembly prior to use, however a detailed list of instructions is included with every purchase. In addition to the TV stands for homes, there is also an even larger selection of stands for commercial and trade show use. One of the best selling units is our plasma mount on wheels. 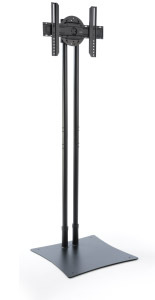 This heavy duty stand is made of high quality steel and comes in either a black or silver finish. 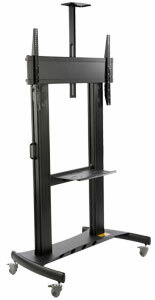 The including mounting bracket that holds the monitor is height adjustable as well as tilting. 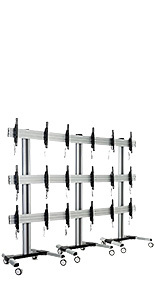 Many of these racks have eight height positions, and can be angled in a downward direction up to fifteen degrees. The wheels on some stands make moving this display a breeze. Once the plasma display is in place, the wheels can be locked to prevent any accidental movement. 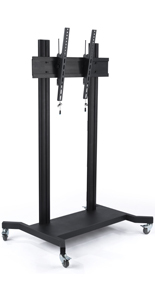 Hospitals and doctors' offices utilize these LCD TV stands to show patients vital information, or in the waiting rooms as a form of viewing entertainment. Likewise; hotels and other large corporations with a lobby use these 70" flat screen TV racks as a means of directing or informing their guests. There is a link on each product page for these LCD TV stands to verify by make and model, what televisions will fit on these displays. 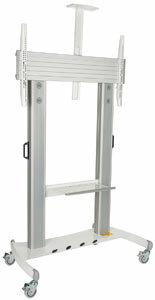 For tradeshow attendees, there are flat screen racks that include a shelf that acts as a workspace. 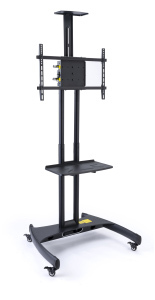 The shelving on these stands for LCD TV can hold a keyboard, DVD player, or other supplemental presentation materials. Additionally, the shelf on these TV stands rotates left to right, and has 3 height positions. 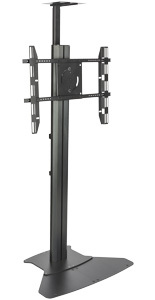 There is an impressive selection of TV stands available here for customers who attend trade shows regularly. 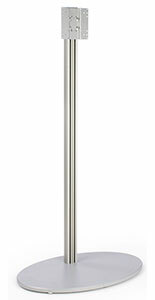 These units serve a wide range of functions, and come in several sizes, colors and styles. 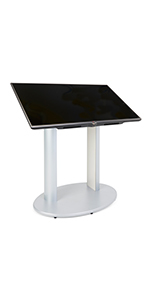 Trade show attendees typically need some type of LCD TV stand that is portable and breakdowns with little effort. There are many options here that meet all of these requirements, and also have many other advantageous features. 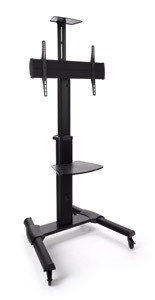 The most popular LCD TV stand among these products is the truss-style stand. 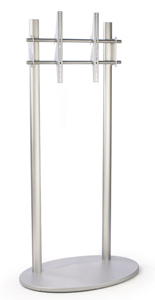 These plasma racks feature an aluminum truss in black or silver, and a wooden oval base. 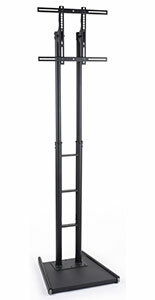 This LCD TV stand can be taken down in mere minutes, and placed into the included canvas carrying bag. One person can easily assemble and disassemble this furniture. No supplemental tools are required to set this LCD TV stand up. 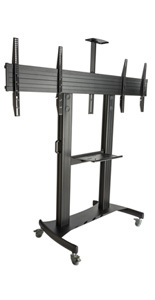 All of these plasma racks can hold a television set horizontally, and a select few also have the choice to hold a TV vertically. One of the newly designed displays within this product line is the all-in-one tradeshow booth. This booth features two truss LCD TV stand units, as well as a huge custom printed backdrop, two wood surface workstations and a carrying case that doubles as podium furniture. Are there different types of stands for flat panel TV available? 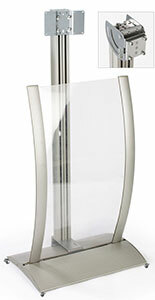 There are fixtures suitable for either business or personal furniture use. There are stands for LCD TV with or without wheels, or units with shelves. 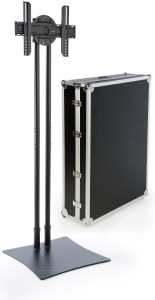 For those attending trade shows, there are monitor mounts that fold down into compact carrying cases. How do I know that my 70" LG LED TV will fit these stands for LCD? Each product page contains a link that lists all televisions by make and model number that will fit. Additionally, each of these stands for LCD lists the Vesa dimensions that will work with the unit. For further assistance regarding this television furniture customers can always call one of the call center staff members. 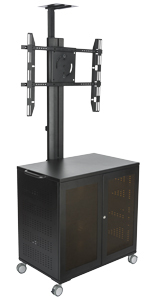 There are many television racks offered here including a select few that can hold a 70" wide screen TV, all of these units are made of the highest quality at reasonable prices. Displays2go is always designing new products to help businesses compete in the continuously changing market. We include these products in the line of flat panel TV stand objects, as well as in a variety of styles to meet any need. This online catalog has thousands of products available, most include same day shipping when ordered by 3PM EST. Also be sure to check out the wide selection of sale and clearance merchandise, as well as the new products that are added to this site daily!